If you want to showcase Udemy course your WordPress site or want to earn money with the Udemy affiliate program then you easily can. The Udemy is one of the popular online learning marketplace which has more than 10 million students and over 40,000+ Courses. 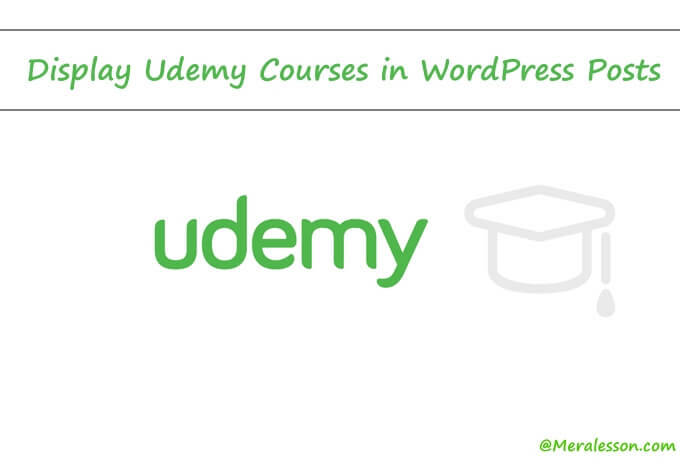 So this tutorial we will show you how you can display Udemy Courses in your website from your WordPress dashboard. You can also add Udemy Courses affiliate links on your site. Udemy is world's largest online learning marketplace where you can learn and can also earn money by selling your courses or by promoting others courses. if you want learn more about how you can earn money from Udemy then read our article on that How To Make Money From Udemy. The Udemy is a new WordPress plugin created by Flowdee Which can help you to display Udemy courses inside your WordPress posts and pages. and also you can add Udemy affiliate links to your site, but you need to upgrade the plugin. It also comes with many features such as Search for courses by keyword, Grids & Lists layout. and many others. If you want to extend this plugin which allows you to add more functionality to your plugin and also recommend you to get the PRO version of Udemy plugin. So the first of the you need to download and install the Udemy plugin through your WordPress plugins interface. So once you have activated the plugin, then you can customize the plugin so go to your Settings tab and click on Udemy. scroll down to output settings and select your output template and you can also display instructor information from there. Now you need to get Udemy course id which you want to display in your post. so go to Udemy site and search for courses and add the course to the cart and take the ID out of the url of your browser. So once have the id, then go to your post or page where you want to add that course and wrap the id with Udemy plugin Shortcode like this [udemy id=" PASTE THE ID HERE "] and update your post. We hope this tutorial may help you to add Udemy course in your WordPress posts. If you want to add Udemy Affiliate links in your WordPress site, then you need to upgrade the plugin to Pro version. So if you like this article then share this tutorial and also like and follow us on Twitter, Facebook to get latest updates from us.